Two years ago, this list could not have been written. But in that interceding timespan, all over the borough the call for craft beer was heard loud and clear by a disparate group of brewers now operating from Long Island City to the Rockaways. Just last month, two new breweries debuted in Queens—one in Glendale and the other in LIC. And that’s why Dan Bronson of Crescent & Vine in Astoria felt it was time that Queens had its own beer week. As it stands, there are currently six licensed breweries in Queens, including Bridge and Tunnel, Transmitter, Big Alice, Finback, Rockaway and Beyond Kombucha. There are also craft beer lovers clubs popping up around the borough, like the guys over at Brewstoria, a monthly crafters club that meets up to taste beers every first Wednesday in (…you guessed it…) Astoria. Now, I am no Garret Oliver, but I’ve been drinking beer (legally) for a decade now, and I have made a point of trying out local favorites wherever I find myself as I have made my way across various corners of three continents (and I tasted dozens of new beers for the first time at Beer Week with a residual beer gut to prove it), so I guess you could say I’m a semi-pro. What I am getting at is, while I know my way around beer, you might find you have your own opinion, in which case you can feel free to take mine with a grain of hops. 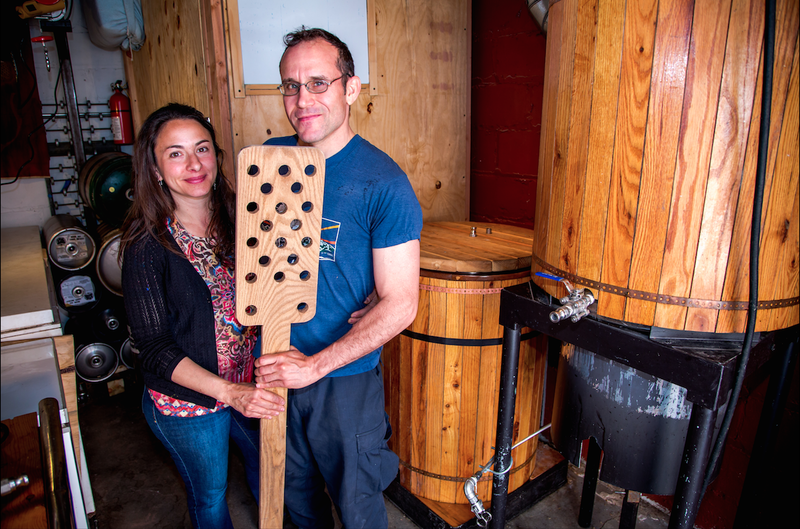 When Spiro Theofilatos began making his kombucha-infused beers, it really started out as just a novelty item since he had to obtain a brewer’s license in order to work with kombucha in the first place. But he is definitely on to something. Now, this is definitely not a beer drinker’s beer, but if you’re one of those who tolerates beer drinkers and wants something to throw back while they nerd out about hoops or football, this love is for you. The Mava Roka is a gluten-free kombucha beer with a fruity, slightly sour flavor and a smooth, full mouth feel. And definitely a perfect and welcome replacement to Mike’s and Ice. SingleCut Beersmiths opened up shop in the further northern reaches of Astoria at the tail end of 2012, making it the second full-scale brewhouse to open in Queens since the end of Prohibition (Rockaway Brewery is the first). SingleCut founder Rich Buceta left a career as an ad exec to pursue his passion for home brewing as it turned into a job at a brewery in Brooklyn, but he quickly realized he wanted to open his own brewery—one in his own borough. Now that Buceta’s brewery is running full-steam, you can forget what you’ve heard: The Smoked Gose is the true champagne of beers. From the center as you pull, your mouth is overwhelmed with a cidery bubble of celebratory success. The next time you’re not sure you should take the champagne toast because you’ve been on beer all night, compromise with this well-balanced option instead. That isn’t to say this is only an occasion beer, but it certainly plays the part well. While Kyle Hurst, the chief brewer at Big Alice, has been known to say that he doesn’t think his brewery will ever win any competitions because their beers don’t fit into any category, I am prone to disagree. And that is why Big Alice’s batch of rye, oat, and hot pepper stout is getting the bronze on my list. True, Big Alice only brews in micro batches, but that doesn’t change the fact that they are making some damn fine beer. Transmitter debuted four of its new beers on the inaugural night of Beer Week at Crescent & Vine, and while all were swig-worthy, it is the Farmhouse Ale that rules the roost. As you draw your glass (or mug, stein, etc.) to your lips, the smell of fresh-cut wheat and fennel surrounds your nose, and a light, fluffy cloud of citrus sifts itself into the surrounds of your mouth like a tidal wave of spring and life and happiness. For all of the country-born city dwellers out there (like me) slinking around the borough, this beer can be an aid to reminisce, allowing you to remember all the reasons you loved home and none of the reasons you left. As a testament to the impact of this unparalleled hazelnut brown, Robby Crafton, one of the brewers at Big Alice, told me that he remembered trying this beer for the first time a year earlier. It’s that memorable. And it is with that stamp of approval that I confidently place Rich Castagna’s Hazelnut Brown securely at the top of this list. Much like the Farmhouse by Transmitter, this beer catches your nose long before it reaches your lips with the soft smell of hazelnut thickly wafting from the top of the glass. Part of how Castagna gets such rich flavoring is in his use of fire over steam to heat during the brewing process. The rest comes straight from the heart. Inspired by his mother’s support in her final years, Castagna opened a microbrewery in her Maspeth garage and named one of his inaugural beers in her honor. From the start, he has been in the habit of giving his beers meaningful names. Take his “$20 and a Switch Blade” for example, named for a time when the father of the Queens Kickshaw’s owner, who was being bullied, sent him to school with $20 in one pocket and a switchblade in the other and made him decide which one he was going to use. Heck, even the paddle that Castagna uses to stir his mash has a great story behind it. The bottom line is, while he is a pretty solid dude and about as hard working as is humanly possible, he’s pretty sentimental, and that sensitivity comes across in all of his creations. While he is still brewing out of his late mother’s garage, Castagna hopes to expand in the near future into a space with a tap room, because for him, brewing is all about the people. And maybe that’s why people love his beers so much.